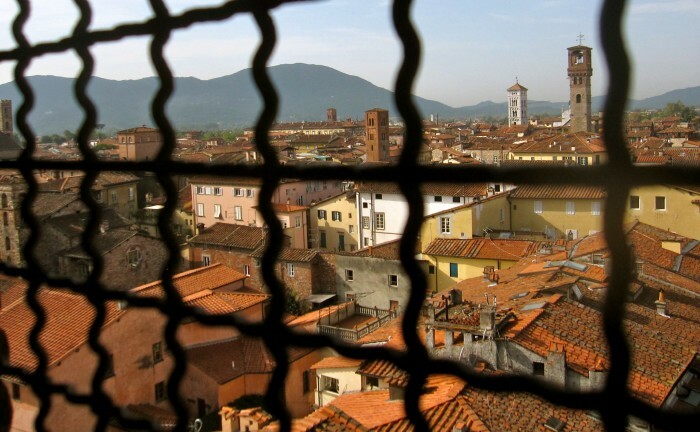 Several months ago my long-time pal, Mara, told me she was leasing out her home in the fall, and simultaneously renting an apartment for herself and 13-year old twin daughters in Lucca, Italy. As long as she’s access to WIFI, she can conduct her business anywhere, so why not take advantage of our flattened world. She enrolled the girls in public school in Lucca, Italy, and a couple of weeks ago, I latched onto their coattails catching a tailwind across the Atlantic. Bicycles are a primary means of transportation inside Lucca’s city walls. Lucca is situated in the Tuscan region of northwest Italy, best known for the intact Renaissance walls encasing the city. Within the massive circular stonework, winding medieval alleys weave around stately piazzas, Romanesque churches, museums, homes and businesses awash in the subtle patina of burnished clay and golden earth tones – best appreciated riding a bike (as do most of the locals) in the warm, slant-lit light of an Autumn day. A brief drive out of the city, and another magic unfolds in Tuscany’s fall countryside. The harvest season begins around the Autumnal equinox with the vendemmia, when small boutique and industrial vineyards harvest the grapes. The economic and cultural importance of wine to Italy cannot be exaggerated as, depending on vintage, Italy and France vie for first or second place in world production of wine. Porcini hunts can be family sport. 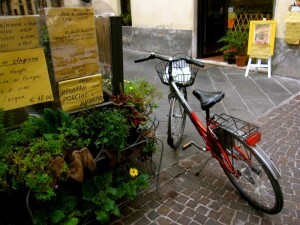 As morel picking in May is great sport to many of us Michiganders, porcini hunts abound in Italy through October, and porcini-centric menus are scribbled on makeshift signs outside local restaurants celebrating the day’s harvest. 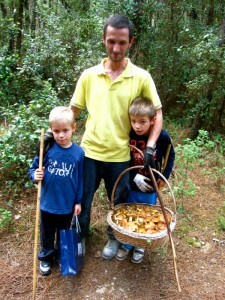 Sagras, culinary community events spotlighting local, seasonal foods such as porcini, are another way of celebrating the bounty. Restaurants participate in hosting the events at large trestle tables in central squares when weather permits. Late October into November celebrates the olive, and many consider small vineyard, cold-pressed sweet Lucchese olive oil to be some of the finest in the world; about now their olive harvest is in full swing. 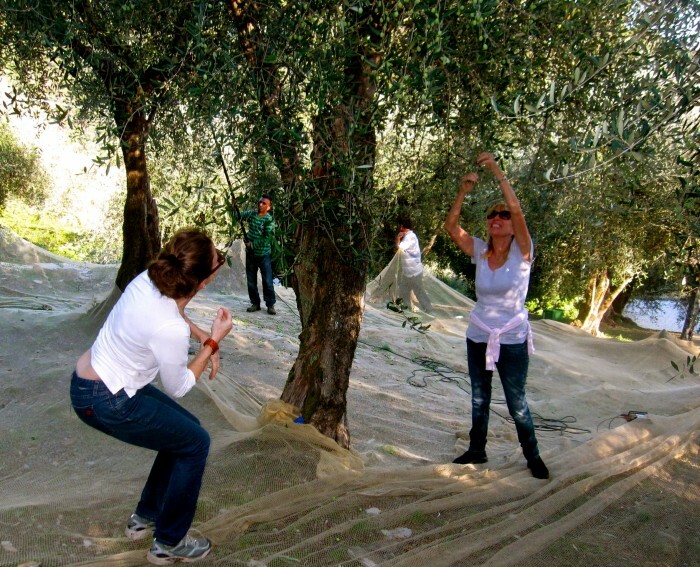 Harvesting olives is communal event,indeed, Mara’s landlady requested our help in her vineyard as did others of her friends. Mara & I “helping” her friend harvest olives. But what most stands out in my mind, was the day we hiked in the terraced mountains of Garfagnana – north of Lucca – amongst the forested slopes filled with Chestnut trees. Baskets linked to elbow, the locals stooped to gather the fallen nuts, one of the most prolific flavors on the seasonal table. Chestnut fallen from the tree. 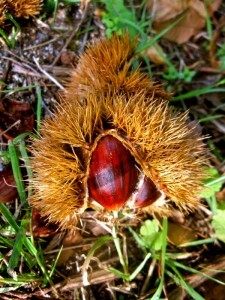 For centuries, the Tuscan cook has held fresh harvested chestnuts dear to their soul. 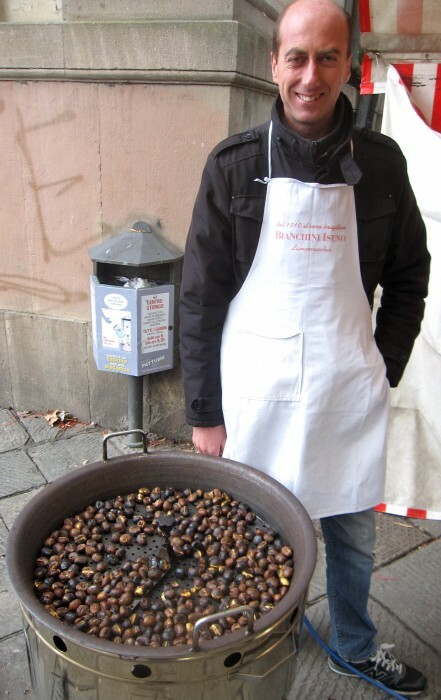 Chestnuts in some fashion are incorporated into many staples: pastas and polentas made from chestnut flour, beer brewed with chestnuts, chestnut-scented honey, to name a few. But the way I best enjoyed them was unadulterated, purchased from a drum-fitted cart in Lucca, which roasted the nuts over an open flame. Peeling away their warm skins and popping them into my mouth, their starchy, earthy flavor reminded me of all the ways they could be incorporated into a holiday menu. For Thanksgiving you may consider tossing them with roasted brussels sprouts, puréeing into a soup, or incorporating them into a stuffing or a pasta dish, as in the recipe I penned below. 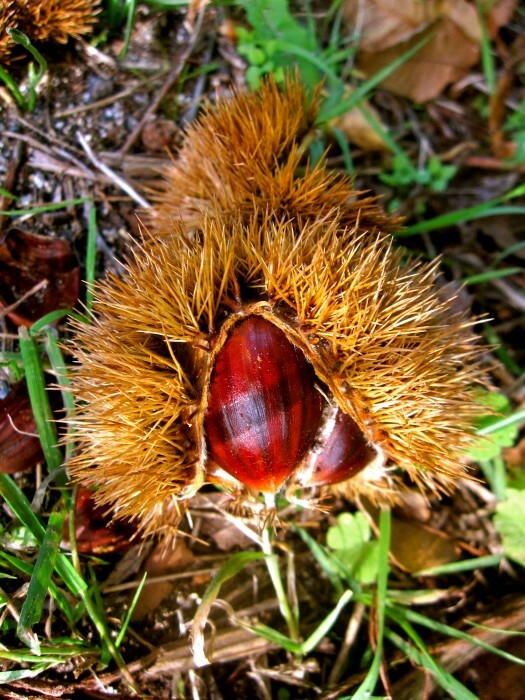 And how did the flavor of Michigan chestnuts stand up to their Tuscan counterparts? The Michigan chestnuts tasted sweeter and richer than those I remember eating in Tuscany, but perhaps I was simply happy to be eating them at home, with my family by my side. With a sharp knife, score an “x” through the skin on the flat side of each chestnut. Place chestnuts on a large, shallow sheet pan and roast, shaking pan once, 25-35 minutes, depending on size of nut. When cool enough to handle, peel, slice and reserve. While chestnuts are roasting, In a large heavy bottomed pan, fry bacon until most of fat is rendered, about 8 minutes. (If using friend sage leaf garnish, fry in rendered bacon fat at this time until browned, then remove and drain.) Add leeks to pan and continue cooking an additional 4 minutes; stirring. Stir in garlic and reserved chestnuts and sauté an additional 1-2 minutes or until garlic is fragrant. Stir in sage and remove from heat. Meanwhile, bring a large pot of salted water to a boil and cook pasta according to package directions or until al dente. Toss pasta with bacon-chestnut mixture and season with freshly ground pepper and grated cheese, to taste. Garnish with fried sage leaves, if using. 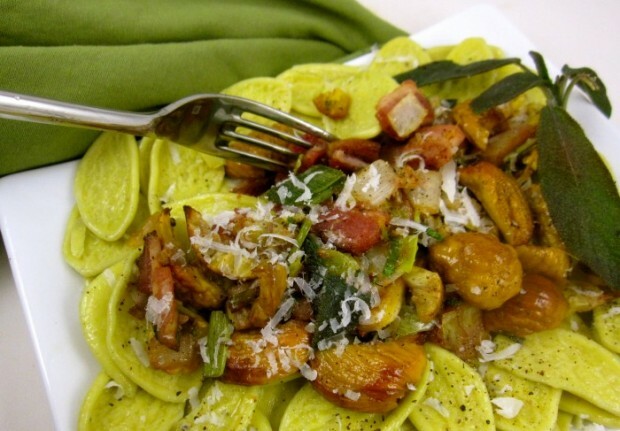 *I used a flat, leaf-shaped pasta from Hillers (the size of a chestnut), but orrechiette, tagliatelle or a chestnut pasta may be substituted.